Sales and inventory numbers are now back to 2012 levels — when the housing market was still buyer-friendly — while prices continue to drop from their record spring highs. 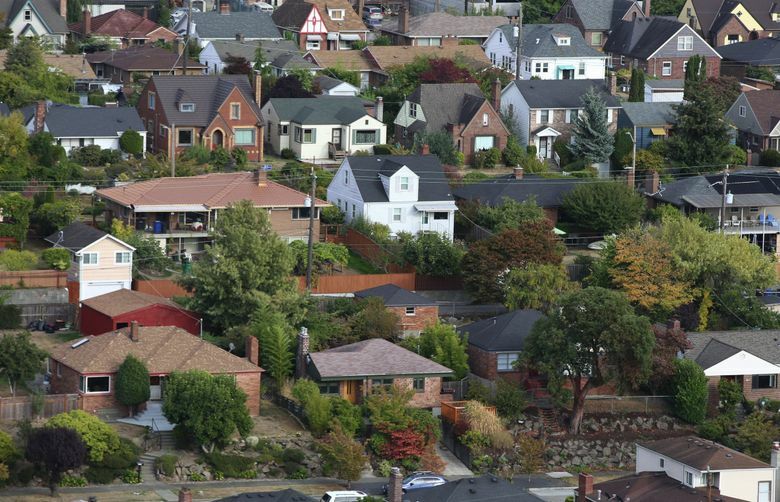 The better news for homebuyers in King County keeps coming: Inventory is way up. Sales are way down. And prices have stopped skyrocketing. The shift has allowed weary would-be buyers to take a breath and avoid some of the hurdles that were standard in recent years when sellers could call all the shots. The tight one-week deadline to bid on homes is now mostly gone. Buyers can submit successful bids while still requiring inspections. And the typical home no longer sells for above list price. Still, it’s not like buyers are suddenly cashing in: Due to rising interest rates, someone who bought a $700,000 house a year ago is paying the same monthly mortgage bill as someone who pays $640,000 for a house today. 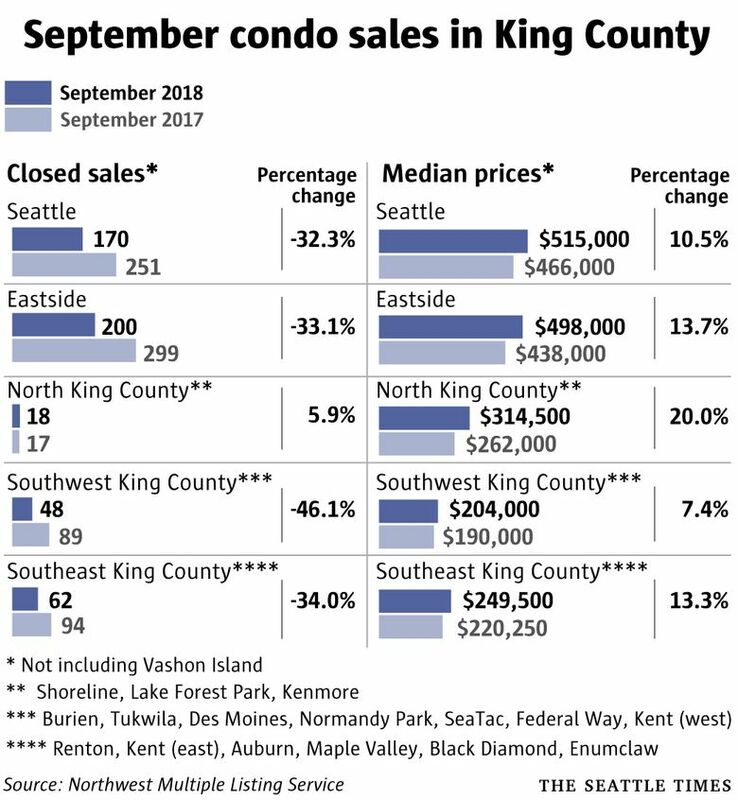 The slowdown in the market, now six months in the making, continued in September when the number of single-family homes on the market in King County jumped 68 percent from a year prior, the biggest increase on record dating back to 2000, according to new data. Only San Jose saw the number of homes for sale jump faster than Seattle among major U.S. metro areas last month. There has been a small uptick in new listings here, but there are more homes available mostly because they’re not getting sold. 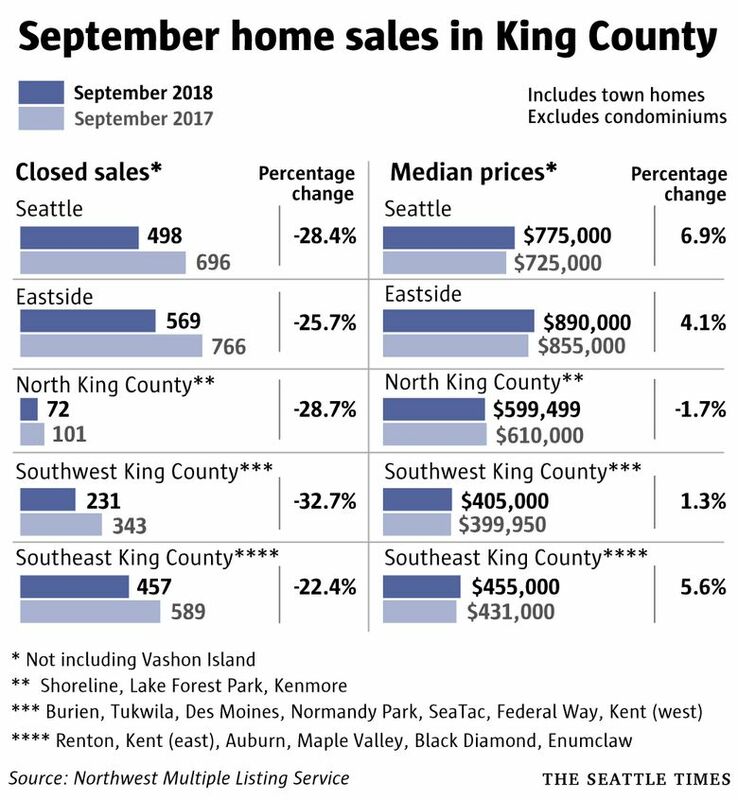 Sales dropped 27 percent across King County, the biggest decline since 2010, when the market was still in freefall, according to the Northwest Multiple Listing Service’s monthly report, released Thursday. Both inventory and sales activity are now all the way back to 2012 levels, when the housing market was just starting to come out of its failed state following the recession. Prices, however, remain nearly double 2012 levels. We’re now at the time of year where prices usually start to drop from their peaks in the spring and summer, but it’s happening on a larger scale this year. Prices countywide have fallen $58,000 from their spring peak; last year in that same time frame prices went down $8,000. Looking closer, prices on the Eastside dipped to $890,000, down $87,000 from earlier this year. In Seattle, the median house cost $775,000, down $55,000 from the city’s peak. Prices countywide are still up 6.9 percent on a year-over-year basis, but that’s about half the growth seen during the last few years. The condo market has undergone an even bigger transformation: In the past year, inventory is up a mind-boggling 133 percent while sales plummeted 34 percent, countywide. Those condos that are selling are still commanding big bucks, however – prices increased 11.6 percent year-over-year, reaching a median of $425,000. Brokers have reported a split among home sellers. Those that have adjusted to the new reality of the market by lowering their prices have been unloading their properties fairly quickly. But those who still have the mindset that prices will continue to soar unabated, and have listed their home for more money than what their neighbor’s house sold for recently, are getting a reality check. “Sellers were certainly becoming greedy,” said Rick Franz, a Windermere broker based in Bellevue. Buyers are now able to take their time a bit – homes that are priced competitively are often selling in a couple weeks, instead of the one-week-offer deadline that was standard as recent as this spring. And while homes used to go for above asking price more often than not, the typical house is now selling right at asking price, according to Robert Wasser, a director for the listing service and owner of Prospera Real Estate. The frequency of bidding wars has also declined. And buyers have found success making offers with contingencies – allowing them to pull back or renegotiate the purchase if an inspection turns up something broken or their financing falls through. Contingencies have historically been standard, but in recent years bidding wars have gotten so intense that just about every successful buyer in the Seattle area had to waive various rights to win. “Buyers quite frankly got burnt out with” all that, Franz said. Michael Bode and his wife sold an Issaquah townhome they had been renting out at the beginning of the year and got the typical response at the time, when the market was still on fire – a quick deal with multiple cash offers about $50,000 above list price. Then in July, they put their house in Redmond up for sale and wound up getting about $25,000 less than what their broker said he would have priced the house at in the spring. And this time the offers had contingencies and weren’t in cash. “It was definitely a significant difference between selling the house in Issaquah vs selling the house in Redmond,” Bode said. A significant issue keeping home prices from rising is the level of interest rates, which have begun growing again in recent months after a lull earlier in the summer. Mortgage rates are now hovering around a seven-year high, at 4.6 percent locally, up from 3.7 percent a year ago. The higher interest rates alone are enough to add $280 a month in housing costs for someone buying the median King County house, compared to a year ago. McDonough and most mortgage loan officers expect rates will go higher before they go lower. One outlier in the listing service’s monthly report was West Bellevue, the priciest part of the Puget Sound region. The neighborhood surged to a record median price of $3.3 million, up 43 percent in the past year. There were only 20 homes sold in the area last month, however, making it easier for prices to fluctuate wildly; still, it was far and away the highest monthly home price recorded for any submarket in Puget Sound history. On the other end, prices are down more than $100,000 from their spring highs in Central Seattle, East Bellevue, Redmond-Carnation and Kirkland-Bridle Trails. Looking year-over-year, prices have dropped more than 5 percent in Jovita/West Hill Auburn, Enumclaw and the Eastside area south of Interstate 90. Also seeing price drops were Southeast Seattle, Sodo/Beacon Hill, Lake Forest Park/Kenmore and Renton-Highlands/Kennydale. The homebuying market in the rest of the metro area is starting to slow, as well, though the cheapest parts of the region are still largely humming along. Snohomish County inventory surged 40 percent while sales dropped 21 percent. The median price of $485,000 was up 7.8 percent from a year ago, but down $26,000 from the high reached in the spring. Pierce and Kitsap counties saw only a small inventory bump but also had a significant drop in sales. 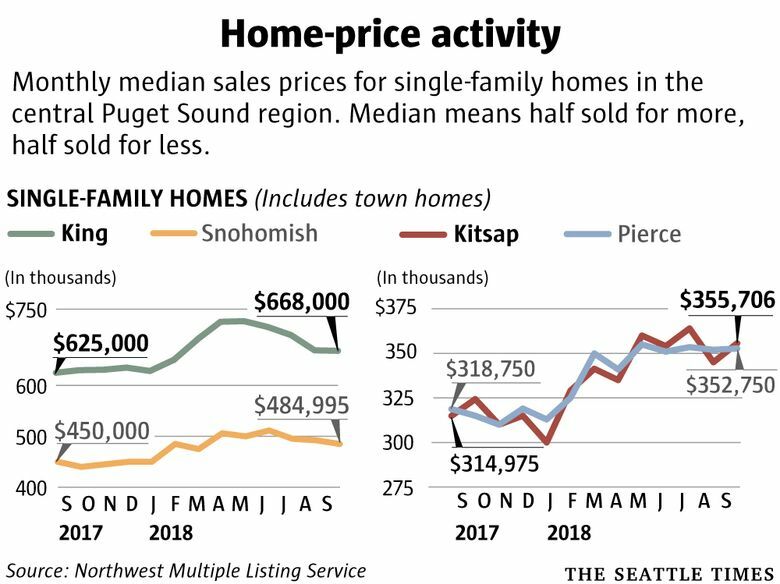 Prices in Pierce hit about $353,000, up 10.7 percent in the past year, and reached $356,000 in Kitsap, up 12.9 percent. Both are down slightly from the records set a few months ago.